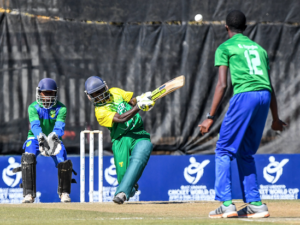 Sierra Leone U-19 Cricket has finally bowed down to a defeat in the ICC U-19 World Cup Division II qualifier, losing to West Africa rivals, Nigeria to a 137-run. The Nigerians went on to lift the U-19 North-West Africa title as they proved a class performance with an emphatic 137 runs win, bowling Sierra Leone all out for 105 run after posting a 242 runs for the loss of 9 wickets in 50 overs. Nigeria opener, Olayinka Olaleye, scored a massive 124-ball century and shared in a 148-run opening stand with Samuel Mba (62) for the first wicket. Olaleye was bowled by Osman Sankoh (2-38) after a brilliant 110 that included just 30 runs from boundaries (six fours and one six). Sierra Leone’s Haroun Kamara, who will turn 14 in seven days-time, had a hand in two run outs and picked up 2-51, to follow up his figures of 3-32 and 4-16 in the previous two matches. Both wickets were stumped by John Bangura, bringing his stumping tally for the tournament to four stranded victims. Sierra Leone replied in the second inning with 105 runs in 31 overs with Captain George Ngegba playing a lone hand in scoring 31 off 44 balls. Peter Aho knocked over the last five Sierra Leone batsmen to finish with 5wickets from 35 balls, backed up by Abdulrahman Jimoh (2-19), and Mohameed Taiwo (2-17). The West African giant, Nigeria went undefeated in the tournament, while Sierra Leone only lost to the Nigerians in the final stage. The two Nations will now compete alongside Uganda, Namibia, Kenya and Tanzania in the ICC U-19 Division 1 which is slated for March 2019.